New ideas. It’s what keeps the audio world fresh and interesting to hobbyists, not to mention various forum threads entertaining. With speakers, due to the limited parts, new designs are few and far between. Fortunately, I’ve been able to spend time listening to a truly unique cabinet design, the Coincident Dynamite. In audio circles, Coincident founder Israel Blume is known to be driven, to say the least when it comes to cabinet design. Standing waves and resonances are his enemy. Over the years, each of his designs have attacked and cornered the duel evils based on his patented approach. The resonances are tuned to a neutral 350hz, whereby physics kicks in and the heat created is dissipated. For the listener, it boils down to music free of artificial frequencies. To deny those pesky axial, tangential, and oblique standing waves some serious engineering design is needed. In accomplishing this, Blume earned a patent for “asymmetrical wall enclosure”. Putting it simply, its way more involved than just using MDF and attaching a few braces. It requires eliminating out of phase waves, a skill akin to threading the needle while off road driving in the Rockies. Of course the Dynamite takes that challenge to a whole new level with its wave cabin shape. By using a CNC woodcutting machine on glued MDF boards, the exterior waves are created. Thru computer modeling the exact bracing for strength and sonic wave elimination are put in place. In order to meet the $2,999/pair price the CNC work is done outside North America. Everything else in the assembly process takes place in Ontario, Canada. A Quick Double Take, eh? The wave side panels may cause a double take with the eyes on first look, but they quickly won me over. Visually, the wave breaks up the long sidewall of the deep rectangular speaker design. 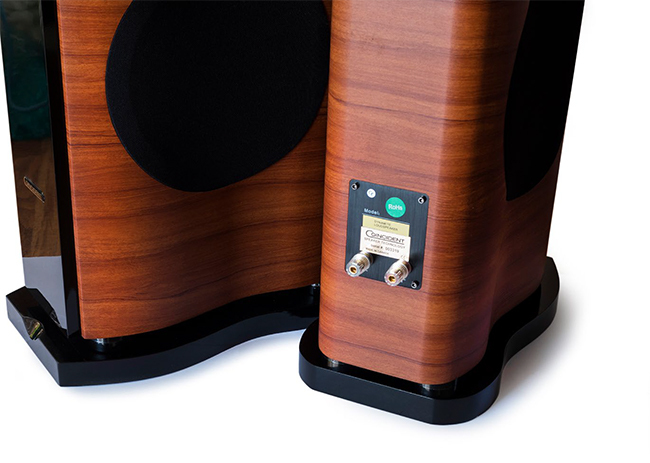 The vinyl laminate is high quality and its low luster finish is the best imitation I’ve seen on speakers. The black front face and top wave of the 46" tall Dynamite’s are fresh as well. The black base is an inch wider creating a more stable foundation. (Those of you with small children or an angry vacuumer may want consider creating some additional type of boundary, a little extra care is advised.) Finally, rounded spiked feet can be attached. Take some time during the first few weeks and decide for yourself if the feet are needed. Tunes with lower mid and bass frequencies quickly reveal the brilliance in the cabinet design. Natural sound is never more true than when hearing jazz ensembles on the Dynamite’s. Listening to Fourplay’s “Bali Run” the string bass along with the bass drum and other percussion is ridiculously clean. The slam was so detailed a visitor thought that a subwoofer lurking in the corner was connected – I had to verify it was not before he would believe me. The same group’s track “101 Eastbound” reveals the same characteristics for the upper mids and highs. The Dynamite’s 1" soft dome tweeter is lightning fast, like a ribbon or Heil driver. All other Coincident speakers use the Heil design, and this may explain similarity of the final voicing. Producing the music comes from a D’Apollito MTM orientation using a pair of 5.25" Kevlar drivers in bumblebee yellow, with the soft dome tweeter as a separator. All three are set near the top of the front face. Each Dynamite also houses an 8" side-firing woofer that brings the speakers overall bass reach down to 32Hz. The extra push provided by these side firing woofers brings additional detail to deep bass notes. Around back near the bottom are the bass port and a single set of 5-way binding posts. 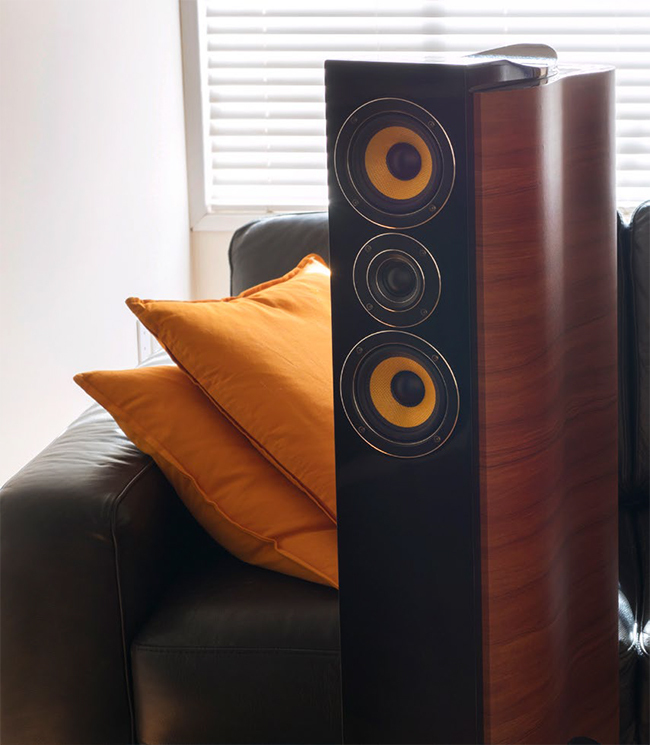 The amount of LF energy produced by such a compact speaker is nothing short of stunning. Cranking up The Who’s “The Real Me” fleshes out John Entwhistle’s thundering bass notes with delicious detail whether in my 9x12 foot man cave or 15x19 foot living room. The Dynamite’s have no problem pressurizing a room at moderate listening levels. Keith Moon’s manic drumming with its rolling from one channel to the other flows without jumping into the listeners face, all the while keeping the synthesizer track and vocals placed solidly in the mix. Getting the Dynamite’s to deliver such top to bottom balance requires a bit of positioning time. Start with the Cardas website and their golden triangle configuration. Much like the Goldenear Triton series in my listening room, pushing the speakers out a foot wider than the textbook triangle proved a great place to start, then listen and fine tune. A few rounds had the Dynamites just 16" from the sidewalls and 36" from the back wall with a slight toe-in. With an sensitivity of 90db at 8 Ohms, the Dynamites are ridiculously easy to drive. More impressive is that they are truly amplifier-neutral. From 150wpc of the Simaudio i7, to 30wpc of vintage Harman/ Kardon 730, to 35wpc of tube love, and 150wpc of class D Peachtree, the Dynamite’s found musical nirvana. The only caveat to be made is that a good quality DAC in combo with the amplifier really moves the needle. The Benchmark DAC3 HGR mated exquisitely with the Dynamites, adding a whole new layer of sonic detail. Our publisher reports excellent results with Coincident’s own Dynamo amplifier producing 8 watts per channel of SET goodness. Moving into the symphonic genre, the 24/96 recording of Trio Sonnerie’s work of “La Gamma”, the strings are forward, naturally sharp and detailed without any harsh artifacts. Between the speakers all the instruments carve a dedicated placement. 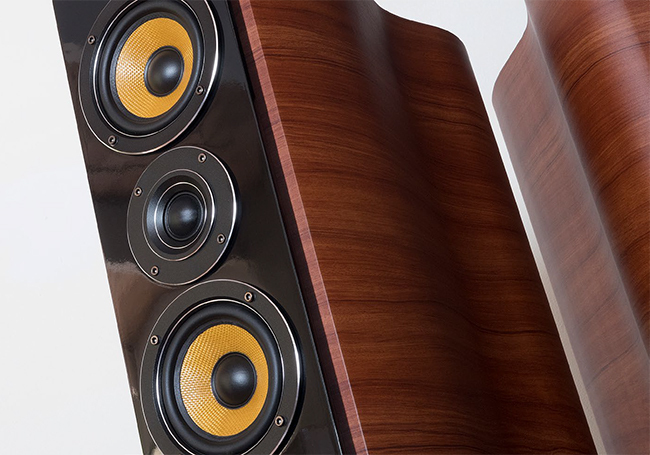 The Dynamite’s ability to create such a deep soundstage between the speakers is first-rate. The vertical soundstage in Trevor Pinnock’s “Bruckner Symphonies No. 2 in C Minor climbed a good two feet above the speakers. The vibrancy of the performance is a lean-in experience. Digging deep into vinyl with Bonnie Raitt’s classic “Nick of Time”, the lead rhythm of the bass comes forward, but doesn’t overpower, signaling the work of a good cabinet/woofer combination. The synthesizer comes off as a mellow xylophone sound, something I’ve never connected before, even with far more expensive speakers. “Woman In Chains” from Tears For Fears, there is a triple vocal chorus that I haven’t consciously heard except with the Harbeth Compact 7es3. Each performer’s voice is distinct yet blends nicely with the others. A real treat for a $3K pair of speakers is how full and nicely resolved horns sound. The level of smoothness is palpable whether it’s Blood, Sweat and Tears, Chicago or the Commodores. The accordion in Dave Grusin’s “Coyote Angel” has an ethereal pleasantness that one rarely connects to the handheld organ. Normally 3-5 minutes is all I can take, but the Dynamite’s push that number well down the time clock. From Grusin, to Krall, to Winston, the piano is tonally honest. Coloration and other embellishments are missing. Decay of notes, a key judge of speaker performance was smooth as silk. The one limitation of the Dynamite’s is that with rare exception the speakers kept the music between the cabinets. Maybe it’s due to the side-firing woofers, but unless you’ve had experience with such a wide-open speaker you won’t miss it. Usually at this price point there are a small handful of compromises. Having just one makes these speakers a bargain. The Coincident Dynamite is a speaker that fits its name. It offers up a value to performance level that is hard to match. With a design rooted in good science and first-rate engineering, the Dynamite’s exceed their price by a fair distance. From its detailed bass to its clear, easy high frequencies, the Coincident Dynamite speakers give the listener a knockout experience. Bestowing an Exceptional Value Award on these speakers is an easy decision to make. Mr. Blume is without question one of high end audio’s high performance (at a very reasonable price) champions. Squirming a bit when I unpacked them and saw the side firing woofers, I’m happy to report they are much easier to set up than a few other models I’ve used with this configuration. Thanks to keeping production costs down, margins a bit tighter than the industry norm and selling direct, Coincident offers a speaker that would cost you considerably more than expected. The level of musical detail that they offer for $3k is incredible. Using them with their own Dynamo amplifier proves excellent, but these speakers were not out of place with my $20,000 Nagra (20wpc) 300i amplifier, or the $7,500 Esoteric F-07 integrated that has become a personal favorite. Amplifier choice will depend on your musical taste, room size and just how loud you need to listen. The Dynamites tick all the boxes and with a much broader stroke than you would expect for the price. Dynamics are there in spades, tonality is very neutral and I experienced a bit wider soundstage than Mark, having a somewhat larger room to spread them out in. Should you be somewhat limited in room size, I’d even suggest corner placement for a bit deeper soundstage – something that always served me well with my Penaudio Serenades. 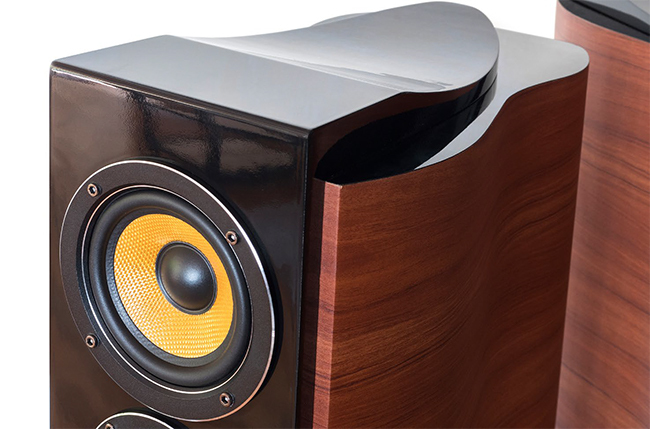 At the end of the day, I defy you to find a more musically engaging speaker for $3k a pair. Well done Coincident!